The periods of Qin (221–206 BC), Han (206 BC–AD 220), Three Kingdoms (220–280), and Jin (265–420) represent a crucial era in the history of Chinese calligraphy. 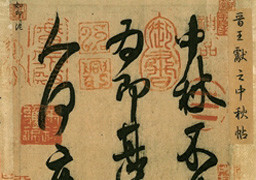 On one hand, diverse forms of brushed and engraved “ancient writing” and “large seal” scripts were unified into a standard type known as “small seal (小篆).” On the other hand, the process of abbreviating and adapting seal script to form a new one known as “clerical script (隸書)” (emerging previously in the Eastern Zhou dynasty) was finalized, thereby creating a universal script in the Han dynasty. 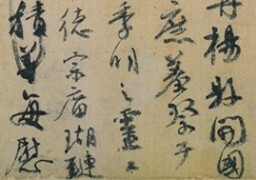 In the trend towards abbreviation and brevity in writing, clerical script continued to evolve and eventually led to the formation of “cursive (草書),” “running or semi-cursive (行書),” and “standard or regular (楷書)” scripts. 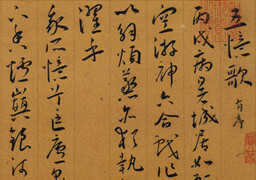 Since changes in writing did not take place overnight, several transitional styles and mixed scripts appeared in the chaotic post-Han period, but these transformations eventually led to established forms for brush strokes and characters. 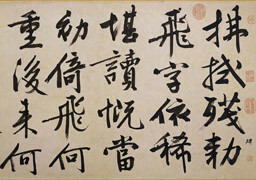 The most famous Chinese calligrapher of all time is from this era—Wang Xizhi (王羲之, 303–361). His son Wang Xianzhi (王獻之, 344–386) and nephew Wang Xun (王珣, 350–401) were also very notable calligraphers. The dynasties of the Sui (581–618) and Tang (618–907) represent another important period in Chinese calligraphy. Unification of the country brought calligraphic styles of the north and south together as brushwork methods became increasingly complete. 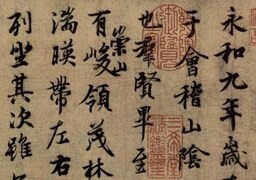 Starting from this time, the regular script would become the universal form through the ages. 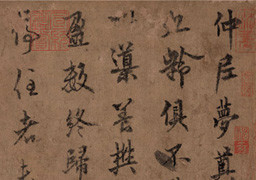 The most famous calligraphers of the regular script include Ouyang Xun (歐陽詢, 557–641), Yan Zhenqing (顏真卿, 709–785), and Liu Gongquan (柳公權, 778–865). 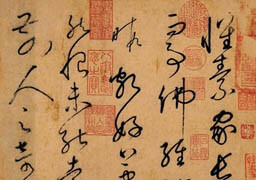 The cursive script also started to flourish during this time, as practiced by Zhang Xu (張旭, ca. 675–750) and Huaisu (懷素, 737–799). In the Song dynasty (960–1279), the tradition of engraving modelbook copies became a popular way to preserve the works of ancient masters. Song scholar-artists such as Su Shi (蘇軾, 1037–1101), Huang Tingjian (黃庭堅, 1045–1105), and Mi Fu (米芾, 1051–1107), however, were not satisfied with just following tradition, for they considered calligraphy also as a means of creative and personal expression. 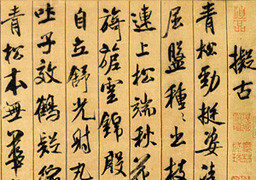 Revivalist calligraphers of the Yuan dynasty (1279–1368), for example Zhao Mengfu (趙孟頫, 1254–1322), in turning to and advocating revivalism, further developed the classical traditions of the Jin and Tang dynasties. 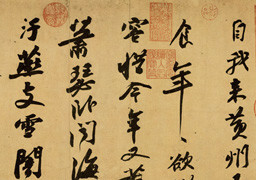 At the same time, notions of artistic freedom and liberation from rules in calligraphy also gained momentum, becoming a leading trend in the Ming dynasty (1368–1644). Among the diverse manners of this period, the elegant freedom of semi-cursive script contrasts dramatically with more conservative manners. Thus, calligraphers with their own styles formed individual paths that were not overshadowed by the mainstream of the time. The most famous calligraphers include Wen Zhengming (文徵明, 1470–1559), Zhu Yunming (祝允明, 1460–1527), and Wang Chong (王寵, 1494–1533), among others. 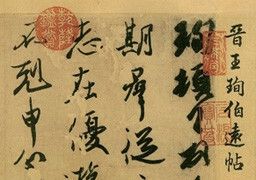 Starting in the Qing dynasty (1644–1911), scholars increasingly turned to inspiration from the rich resource of ancient works inscribed with seal and clerical script. Influenced by an atmosphere of closely studying these antiquities, Qing scholars became familiar with steles and helped create a trend in calligraphy that complemented the Modelbook school. Thus, the Stele school formed yet another link between past and present in its approach to tradition, in which seal and clerical script became sources of innovation in Chinese calligraphy. 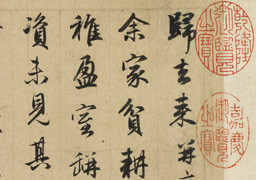 Notable calligraphers from this period include Deng Shiru (鄧石如, 1743–1805) and Zhao Zhiqian (趙之謙, 1829–1884). Chinese calligraphy is an Oriental tradition rooted in centuries of practice. It is an art of turning square Chinese characters into expressive images by varying the speed and pressure of a pointed Chinese brush. By controlling the concentration of ink, the thickness and adsorptivity of the paper, and the flexibility of the brush, the artist is free to produce an infinite variety of styles and forms. 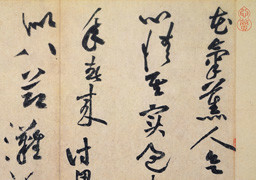 In contrast to western calligraphy, diffusing ink blots and dry brush strokes are viewed as a natural expression rather than a fault. While western calligraphy often pursues font-like uniformity, Chinese calligraphy emphasizes more on expressing one’s emotions. To the artist, calligraphy is a mental exercise that coordinates the mind and the body to choose the best styling in presenting the content of the passage. It is a most relaxing yet highly disciplined exercise indeed for one’s physical well-being and spiritual cultivation.